What happens when a good idea goes bad? 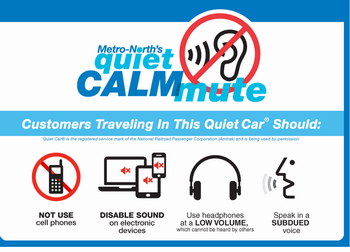 Consider Metro-North’s ‘Quiet Car’ initiative. Sixteen years ago a group of regular commuters on Amtrak’s early morning train to DC had an idea: why not designate one car on the train as a ‘Quiet Car‘, free from cell phone chatter and loud conversations. The railroad agreed and the experiment proved a great success. Now all Amtrak trains in the Northeast Corridor have a ‘Quiet Car’. They are a major selling point for taking the train … the chance to nap or read in a quiet environment. Almost immediately the plan ran into trouble. Not because it wasn’t wanted but because it wasn’t enforced. There were no signs designating which were the ‘quiet’ cars and only occasional PA announcements before departure reminding folks who sat there of the quiet, library-like environment that was expected. Most of all, many conductors refused to enforce the new rules. But why? Conductors seem to have no trouble reminding passengers to keep their feet off the seats, put luggage in the overhead racks or refrain from smoking. But all that the railroad gave conductors to enforce the ‘Quiet Car’ rules were bilingual “Shhh cards” to give to gabby violators. It seemed left to passengers to remind fellow riders what a ‘Quiet Car’ was for and confrontations resulted. This spring the railroad surprised even me by announcing an expansion of the program: every weekday train, peak and off-peak, would now have two ‘Quiet Cars’! Two ‘Quiet Cars’ on a 10-car train gives everyone a choice. That sounds great, but still without signage, education or enforcement, the battles continued. A commuter recently emailed me about an evening train from Grand Central with a group of rowdy drunks in the ‘Quiet Car’. 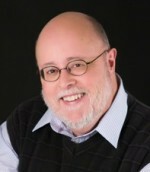 When commuters asked the offending passengers to chill out or move their seat, the tipsy group told the complainer, “screw you.” The quiet-seeking commuters then asked the conductor for help but he simply declared the train was too crowded and the ‘Quiet Car’ was being eliminated on that run. “Have fun” he told the drunks. Really? On Amtrak trains those violating Quiet Car rules have been thrown off the train and arrested. Even NJ Governor Chris Christie had to move his seat on an Acela once for yabbering with his staff in the wrong car. Nobody wants these kinds of altercations on Metro-North. So why initiate and then expand such a passenger amenity as ‘Quiet CALMmute’ without proper education and enforcement? A few signs and friendly reminders from conductors should make passengers aware that “train time may be your own time” (as the railroad’s old marketing slogan used to say), but it’s also shared time. Commuters want ‘Quiet Cars.’ The railroad gave them to us, but until they can get their staff to enforce the rules, consistently, they might as well not exist. If you’re in a ‘Quiet Car’ and the rules are not enforced, report it to Metro-North on their website complaint form. If we all raise our voices, we can get some peace a quiet. Republished with permission of Hearst CT Media.